Looking Good For Reading In The Sun? 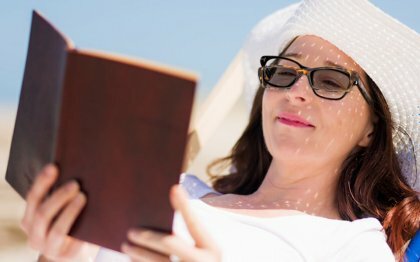 Is the old ‘sunglasses-over-readers’ trick cramping your summer reading style? Faced with a choice of glare or blurriness (both great recipes for headaches and strained eyes), the two-pairs-at-once technique may be a functional workaround for sun-loving bookworms, but it’s not going to win any fashion plaudits - and, of course, it means carrying that extra pair of specs to the beach. Now The Reading Glasses Company, London, have introduced a comprehensive range of sun reading glasses for men and women, which combine style, quality and affordability. Our sun reading glasses (or ‘sunreaders’) are available in a wide range of modern or traditional frame styles, and are all offered in a choice of six diopters (strengths) to suit most long-sighted readers’ needs. Our high-quality lenses provide the all-important UV400 protection against potentially harmful UVA and UVB rays, while sturdy frame designs, incorporating metal and/or spring hinges, ensure these glasses are just as hard-wearing as they are fashionable. own under that sun hat! If you are not sure which strength sun reading glasses you need, try our free eye chart. Browse our sun reading glasses.